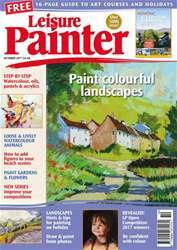 I enjoy reading the letters’ page in Leisure Painter and thought that some readers may like to consider a technique that I tried at a watercolour workshop that I attend. I am not good enough yet just to paint a subject without drawing an outline first. When drawing delicate subjects, such as flowers or birds, in watercolour where I don’t want the graphite outline to show through, I used to paint carefully up to the inside of the line (without going over it) then rubbed out the graphite when the paint was dry. This I found challenging so I tried an alternative method.